Thanks to a unique combination of natural Omega-3 fatty acids obtained from fish, as well as vitamins D, A and E, Möller’s Cod Liver Oil constitutes a natural supplementation of a healthy diet. Thanks to its beneficial properties, Norwegian healthcare institutions recommend daily consumption of cod liver oil both in the case of children, starting at the 4th week of life, as well as adults. Möller’s Norwegian Cod Liver Oil is especially rich in DHA fatty acid which supports the proper functioning of the brain and contributes to maintaining proper eyesight functions**. Vitamin D is essential for proper growth and the development of skeletal system in children. *Beneficial effect is achieved with a daily consumption of 250 mg EPA and DHA **Beneficial effect is achieved with daily consumption of 250 mf DHA. 500 ml and 250 ml. With natural, lemon and fruit flavor. Recommended daily consumption for children and adults: 5 ml. Recommended daily consumption in case of infants: 2.5 ml at the beginning and gradually increasing the dose to 5ml by the 6 month of life (lemon flavor). 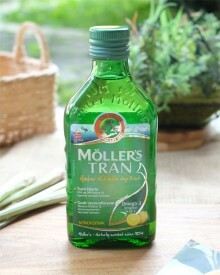 Möller’s Cod Liver Oil is sold in grocery stores and pharmacies throughout the country. In case of quality we never take shortcuts. Our cod liver oil is produced from the Norwegian Arctic cod, harvested at the coast of the Lofoten and Vesterålen archipelagos. We constantly strive to provide our clients the best products which have beneficial effects on their health. In the framework of the recently introduced quality development program, Möller’s products now contain a higher amount of natural antioxidants which ensure protection of the healthy omega-3 fatty acids present in our cod liver oil. That is why we can offer our clients a better quality product from the very first drop to the last! Vitamin D – recommended daily consumption: children over 1 year old, adults under 75 years old as well as pregnant and breast-feeding women – 10 μg; recommended daily consumption for people over 75 years old – double dose, i.e. 20 μg. Möller’s Norwegian Cod Liver Oil is not to be used in combination with other products containing a full dose of vitamin D. In case of simultaneous usage of Möller’s Norwegian Cod Liver Oil and another preparation, e.g. Sana-Sol, we recommend taking half a dose of each of them. In case of doubts please contact your doctor or our Customer Service Center.